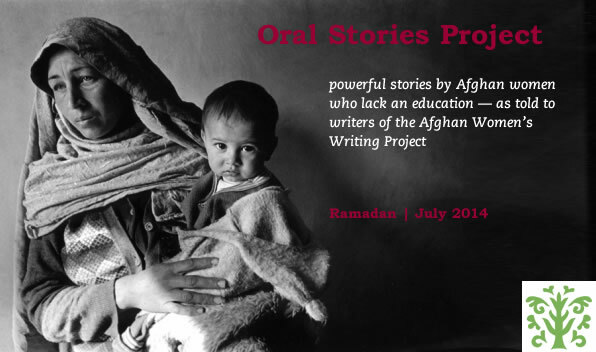 In this sixth feature in our Oral Stories series, AWWP writers went into the streets of Afghanistan’s major cities to gather the stories of poor and illiterate Afghan women during this holy month of Ramadan, which began on June 27th. During the long summer days—fasting without food or water—our writers interviewed dozens of women selling hats and trinkets or working as house cleaners or school sweepers about what happens in their lives at Iftar—when the sun goes down and it is time to break the daily fast. But Iftar may not be joyous for the poor. The dozens of women interviewed by our writers provide more grim accounts of their Ramadan in 2014, a month of political uncertainty with the presidential elections in dispute and the direction of a future government unclear. Sayara, another student writer in Kabul, says food prices are all high in Kabul because of the uncertainty this Ramadan. Poor people don’t have $1 for a package of dates. The stories were recorded, transcribed and translated into English and edited for clarity. Founded in 2009, AWWP is staffed by dozens of volunteers and financially sponsored by donors.